The Florida swamps have proven fertile the last couple of years with old guard representatives Deicide, Monstrosity, Morbid Angel, and Pessimist (who are Floridian by proxy) all releasing commendable offerings. Malevolent Creation has always been relegated to something of a second-tier status despite having a more consistent repertoire, indefatigable work ethic and a relentless worldwide touring schedule than most of their more accessible, more readily marketable peers. Few bands can survive the loss of an iconic frontman. Even fewer can survive multiple complete line-up overhauls and still sound recognizably like themselves. “The 13th Beast” (which we’d hoped to be a temporary working title) is historic for being the first Malevolent Creation album since the untimely passing of Brett Hoffmann and their 13th since their formation in 1987. On “The 13th Beast” Phil Fasciana and his Malevolent Creation re-emerge with renewed vigor and purpose. Il faut le faire, recording 13 albums with a near-constant revolving door line-up over 30 years. Malevolent Creation isn’t an institution for nothing. Their dysfunctionality is legendary. The sheer amount of in-fighting this band has endured is infamous and their turnover in personnel borders on the astronomical. Yet somehow they’re still here. In all face of all the hardship, all the opposition (or indifference, it’s hard to say which) they’ve endured over the years Phil Fasciana shows no signs of resigning or even slowing down. To be frank, Fasciana has never written an outright terrible album. Sure, there were some releases we were invariably indifferent towards along the way – but they never strayed too much, if at all, from their established formula. For over an incredible three decades and counting Malevolent Creation has proven resilient in face of the kind trials and tribulations that would have killed any lesser band a long time ago. As the Dying Fetus of the Tampa Bay Area Phil Fasciana has lived through his share of controversy and disaster. In what has become a sad tradition for this unit a lot has changed in the Malevolent Creation camp since “Dead Man’s Path”, their debut on Century Media Records, in 2015. Firstly, in 2016 Jason Blachowicz (bass guitar), Justin DiPinto (drums), and Gio Geraca (lead guitar) either all left or were fired depending on who you ask. Secondly, and far more tragic, long-time frontman Brett Hoffmann was felled by colon cancer in July 2018 ruling out any future reunions of the classic line-up. Instead of bringing back former frontman Kyle Symons and bass guitarist Gordon Simms from the 1998-2004 era Fasciana has assembled a cast of relative nobodies. Lee Wollenschlaeger (who pulls double-duty on lead guitar) is given the Herculean task of replacing iconic late frontman Brett Hoffmann and his substitute Kyle Symons. Josh Gibbs (from universally and uniformly reviled retro-thrash metal act Thrash Or Die) replaces Jason Blachowicz, Gordon Simms, and Mark van Erp. Philip Cancilla, who gained some notoriety with South Carolina’s Narcotic Wasteland, replaces illustrious institutions as Justin DiPinto, Gus Rios, Dave Culross, Derek Roddy, Alex Marquez, and Lee Harrison. Of all the different reconfigurations that Malevolent Creation has gone through this is one of humble unknowns. On “The 13th Beast” several of Malevolent Creation’s various iterations converge. Structurally it’s the closest to “Retribution” one is likely to get in the modern age. Some of the guitar work harkens back to “The Fine Art Of Murder” and the soloing is some of the finest in years. Wollenschlaeger combines the percussive qualities of Symons with the grittier bellowing roar of Blachowicz on “Eternal” and “In Cold Blood”. Cancilla is as good as anyone who sat behind the kit for this band and Gibbs’ thick bass guitar lies prominently in the mix. Songs typically come in two varieties. First, there are the Slayer inspired tracks that borrow from “The Ten Commandments” and, secondly, the more straighforward, no-frills blast exercises in tradition of “Envenomed”, “The Will to Kill” and “Warkult”. Malevolent Creation was never known for its experimentation and their tried-and-true songwriting approach has yet to show any notable defects. They might not write albums that tend to innovate their genre but they always form good representations of it. “The 13th Beast” is no different in that regard. It presents no novelties whatsoever and amply demonstrates that there’s a place for Malevolent Creation in 2019. “Dead Man’s Path” was somewhat all over the place, “The 13th Beast” possesses a greater focus. Not quite as spectacular this time around is the artwork. Once upon a time Malevolent Creation could be counted upon to have decent artwork. Those hoping that Fasciana would commission canvasses from Adam Burke, Brian Smith, César Eidrian, Giannis Nakos, Federico Boss, Raphael Gabrio, Marcos Miller, Andrey Khrisanenkov, or Cristina Francov won’t find them here. “The 13th Beast” perseveres with Chilean artist German Latorres whose work on “Dead Man’s Path” was far better than this unforgivable eyesore of a cover. Whether it were the classic Dan Seagrave canvasses of the early years or the digital covers from 2000-2007, anything and everything is superior to this cartoony abomination that’s supposed to look evil and intimidating. The days of Malevolent Creation consistently delivering in the visual aspect are apparently well and truly behind them now. It slightly takes away from the experience as Malevolent Creation is usually better than this. At least they are one of the few to have their integrity intact three decades in. In 2004-2006 Saskatchewan power metal unit Into Eternity was a force to be reckoned with. They were on Century Media Records, on every major touring package in North America and pretty much on top of the world as it was. “The Incurable Tragedy”, overt populist metalcore disposition notwithstanding, saw the Canucks experiencing an even greater wave of popularity and visibility. Then… nothing happened. In the decade that followed Into Eternity, like so many bands of yesteryear, fell into disrepair as they lost members as well as their long-time recording contract with Century Media Records. Popular tastes and the metal scene as a whole moved on to the next fad as they are wont to, inexplicably making Swedish occult retro-rock band Ghost and J-pop sensation Baby Metal (hardly the best the country has to offer) the most popular (not to mention lucrative) items of recent memory. 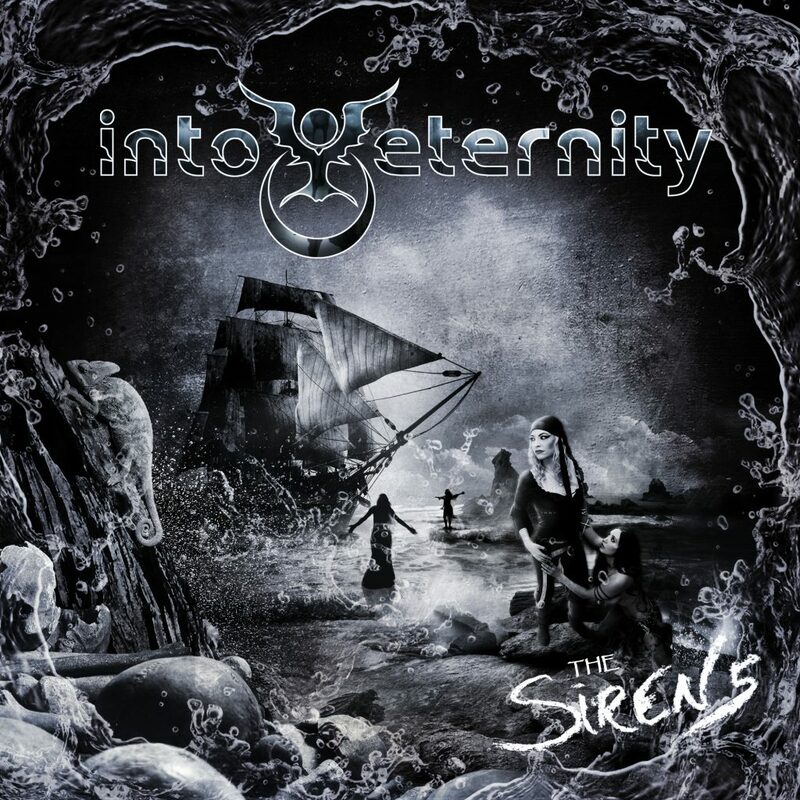 Then “The Sirens” was released to the sound of crickets on the M-Theory Audio label in October 2018. Twelve years removed from their last good album and a decade after “The Incurable Tragedy” the question doesn’t lie so much in Into Eternity’s innate ability as a band but whether or not the metal scene at large has moved on during their unusually long absence. From days of “The Incurable Tragedy” and “The Scattering Of Ashes” only founding member Tim Roth (lead guitar, vocals) and Troy Bleich (bass guitar, vocals) remain. Justin Bender (guitars) has moved over to the production seat and replacing him is Matt Cuthbertson. Steve Bolognese went on to substitute original drummer Jim Austin, but for “The Sirens” Bolognese relinquished his position to Bryan Newbury. Finally, and probably most important of all personnel changes this band has seen to date, Amanda Kiernan was given the daunting task of replacing the man of a thousand voices Stu Block. “The Sirens” was a long time coming and delayed for at least two years. ‘Sandstorm’ and ‘Fukushima’ were released as singles in 2011 and 2012, respectively, when Block was still part of the band. At one point “The Sirens” was scheduled for release on much smaller Italian label imprint Kolony Records but apparently that agreement collapsed somewhere in the interim. A new contract was brokered with the equally low-profile M-Theory Audio and now, twelve years after their last offering, Into Eternity is back, supposedly one assumes, in full force. That Into Eternity has chosen to keep Amanda Kiernan permanently in the position that she was initially hired to temporarily fill shouldn’t surprise anyone. 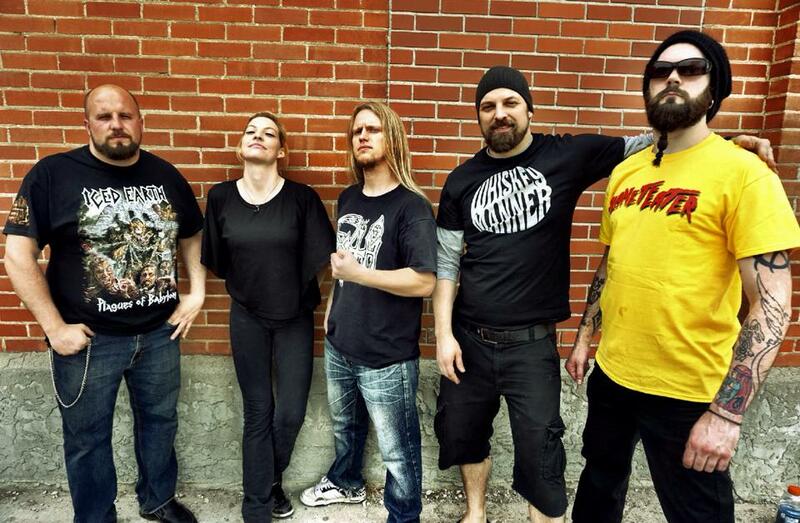 Canada has a history with female-fronted traditional metal going as far to the eighties with the likes of Messiah Force and since 2013 there has been something of a resurgence of female-fronted underground metal in the Great White North. Those hoping that Tim Roth would hire that other Amanda (Amanda Marie Gosse from Category VI) will be sorely disappointed. Whereas Gosse has the actual high register and falsetto Kiernan is of a grittier persuasion and far closer to Debbie Levine from Lady Beast in comparison. At least there’s sense in hiring Kiernan as female-fronted metal, especially the traditional metal kind, has proven commercially successful and incredibly popular in places like Scandinavia, Germany, Asia (especially Japan) and North America. Now that Stu Block has moved on to the greener pastures of Tampa, Florida power/thrashers Iced Earth “The Sirens” conclusively proves that a decade-plus absence hasn’t dulled Into Eternity in the slightest. In fact it very much sounds like a band with something to prove. A strange duality is what defines “The Sirens” for the most part. The five new cuts are probably some of the most technical, melodic material Roth has penned to date. ‘Sirens’, ‘Fringes of Psychosis’, ‘This Frozen Hell’, ‘Nowhere Near’, and ‘Devoured By Sarcopenia’ all clock around (and upwards of) 7 minutes. ‘Sirens’ even opens with an extended piano - and orchestral piece. The two preview singles that preceded “The Sirens” lean more towards their 2006-2008 era and not nearly contain the amount of proverbial fireworks and bravado that their new material does. The inclusion of ‘Sandstorm’ and ‘Fukushima’ is far more damning especially in light of both having been around for many years at this point. It’s understandable that Roth decided to record them with Kiernan at the helm, but that doesn’t change the fact that that space could have been put to better use for another new song. ‘Sandstorm’ and closing track ‘The Scattering Of Ashes’ are the most conventional in length and the latter sort of has the feel of a refurbished b-side of the accompanying 2006 album. “The Sirens” tackles a wide variety of subjects, both fictional and real. ‘Sirens’ is about the singing creatures of Greek mythology. ‘Fringes Of Psychosis’ and ‘Nowhere Near’ are about mental deterioriation and depression. ‘This Frozen Hell’ is a cut decrying the ungentle Canadian winter very much in tradition of Cryptopsy’s ‘…And Then It Passes.’ ‘Sandstorm’ chronicles Operation Neptune Spear and the capture and killing of terrorist leader Osama Bin Laden, the perpetrator of the 9/11 attacks on the World Trade Center. ‘Fukushima’ is, should the name not be enough of an indicator, about the Fukushima Daiichi disaster following the Tohoku earthquake and tsunami on March 11, 2011. Roth’s loyalty to Touchwood Studios in Regina is admirable and “The Sirens” probably sounds far better than it has any right to considering there wasn't a major label behind the funding. It has what is probably the gnarliest production work Into Eternity has yet seen, especially compared to the Century Media Records releases of yore. Bryan Newbury’s energetic and versatile drumming in particular sounds probably worse than Nicholas Barker on Dimmu Borgir’s “Puritanical Euphoric Misanthropia”. It would behoof Into Eternity to consider recording drums at a different facility such as The Grid Productions in Québec with Christian Donaldson or at Wild Studio in Saint-Zénon with Pierre Rémillard. "The Sirens" is rough around the edges and it absolutely takes no prisoners, to say the very least. The Mattias Norén artwork is line with Into Eternity’s prior releases and very much cements that Roth and his cohorts never left the 2002-2008 sphere. “The Sirens” lacks some of the overall polish and gloss that its Century Media releases had in abundance. It very much is the album that directly should have followed 2008’s semi-conceptual “The Incurable Tragedy”. A decade has passed since that release and Into Eternity is pretty much in the same place they were in 2006-2008. At least they are consistent. Ultimately “The Sirens” is very much a victim of its prolonged gestation period. Had this been released in 2012 its impact would have been considerably greater. There’s only so many people Into Eternity can reach now that they no longer have the clout of the Century Media Records promotion department behind them. It speaks volumes about the sorry state of the industry when an established band like Into Eternity, who has plenty of experience in the studio as on the road, has trouble securing a long-term recording contract. How come Nuclear Blast, Spinefarm, AFM, Massacre, Season Of Mist, or Napalm Records weren’t involved in a fierce bidding war to sign these dyed-in-the-wool Canucks? For the longest time it looked as if Into Eternity’s hiatus was going to be permanent. Thankfully “The Sirens” proves otherwise and obviously Tim Roth has many songs still in the tank. Few bands can manage to bounce back from an extended hiatus so strong and convincing as Into Eternity does here. Hopefully it won’t be another decade or so before they come around to releasing a follow-up to this kinda, sorta “comeback” album.